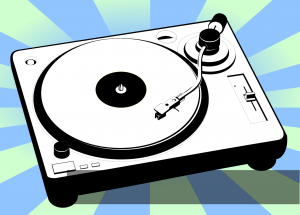 You are here: Home / Turntable Reviews / What’s the Best Affordable Record Player? 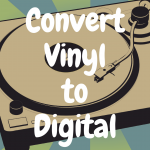 If you’re interested in getting up and running with playing vinyl records, but you’re looking for an affordable record player, then you’ve come to the right place. 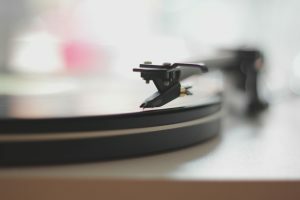 In this article, I’m going to explain to you everything you need to know to get started when it comes to playing music on vinyl (consider this a helpful beginners guide to getting into turntables, if you will). 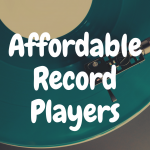 I’ll also lay out a handful of great record players that are not only good at playing your records, but are really good options for the money too. Now, it should noted that getting into records doesn’t have to be an expensive endeavor like some people claim. Some “audiophiles” will tell you that you need to spend a few thousand dollars to get a record player that does a halfway decent job. The fact is that you can get started with a limited budget and still find some pretty decent equipment. For the purpose of this article, we are going to limit our maximum budget to $500 because this is the sweet spot on today’s market in (our humble opinion). Now, before we actually break down our recommend record players, let’s first talk about a handful of turntable elements or parts you want to see in the record player you end up buying (and the pros and cons of each). If you look at a record player, you can immediately recognize several components. You are going see the housing, which is the box where all the electronics are, the platter, and finally the tone arm. The housing hides the motor, which spins the platter where you load records. If you would like to get familiarized with every element of the turntable, check out this neat infographic for a more detailed description. The former means that the motor is actually displaced to the side and is connected to the platter using a belt. The benefits of this approach are the reduction of vibrations and cheaper manufacturing costs. On the other hand, belt driven systems take longer to spin the platter and they can we worn out. With that said, the consensus is that belt drive is the optimal choice if you want best audio quality. Direct drive means that the motor is placed in the center of the turntable and is driving the platter directly. This is a bit more expensive option. The con of using a direct drive is the increase in vibrations, but that is solved using a slip mat which provides a buffer between the platter and the vinyl. The tone arm is the part of the record player which guides the cartridge and the stylus on top of the record. A cartridge is that bulky piece that sits on the very end of the tone arm and is used to translate the groves on the record into an electrical signal that is later sent to the amp. This component also houses the stylus. A stylus is basically that needle that reads the grooves, and it’s extremely delicate, so be careful with it! In order to prevent damage to the stylus and the record, there is a counterweight on the opposite end of the tone arm. You need to calibrate the counter-weight so that the stylus is applying the right amount of force on the record, which won’t damage either component. Just like it’s the case with any other Hi-Fi equipment, pre-amps are a pretty big deal when it comes to turntables. 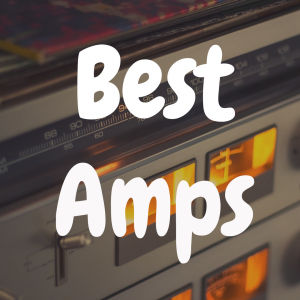 Most affordable models come with built-in pre-amps, but that is not always the best choice. Ideally, you will want to have a built in pre-amp because it’s cheaper, but also an option to bypass that amp when you decide to upgrade. 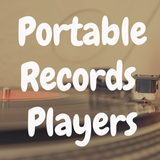 Record players we have today come loaded with various features. Since we are talking about budget models, most of those features don’t really matter. What we are looking for is the best quality record player for our money. That means we want the core performance to be on point, but anything else comes second. If you’re a beginner that’s in the market for a new turntable, it’s very important to know that there are different kinds of vinyl records, and that they spin at different speeds. With that said, there are two main types of records which are being used today. You have the 33 1/3 RPM speed records and 45 RPM ones. These numbers indicate how fast the record is playing. The 33 1/3 RPM is what albums are recorded on—these are often going to be the big, 12” record discs that most people are familiar with. The 45 RPM record disc is what singles are recorded on. These discs are usually almost half the size of the 12” record (these are 7”, to be specific), but they spin at a faster rate. The musical fidelity on 45 RPM records tends to be a bit better than those that spin at 33 1/3 RPM. The operating word here is budget. Contrary to popular belief, you can get audiophile level record players in the $200-$500 range. Going lower than that is not really recommended because models in that range can cause damage to the record, and are generally not reliable. 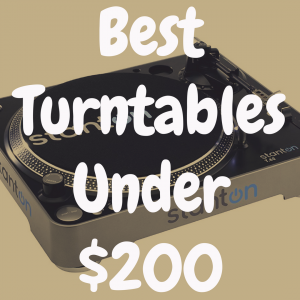 Alright, now that we know what we’re looking for, let’s check out some of the best record players you can get under $500. These won’t be listed in any specific order. Rather, we are going to start with the ones we like the most, and take it from there. Talk about a modern classic. This record player has been around for a while and it showcases everything Audio-Technica is known for. First and foremost, it falls well within our price range. It’s built like a tank and brings you the type of core performance we were talking about earlier. With the LP120, you can play 33, 45 and the far less common 78 RPM records. It’s a direct drive unit, which isn’t really optimal but is more than acceptable in this case. One thing that puts this particular model on top of our list is the amount of control you have over the record and the turntable itself. The tone arm is fully adjustable, which means you can calibrate the anti-skate dial and the height of the tone arm. On top of that, the cartridge is removable, as is the counterweight. What all of this means is a lot of customization options down the road. Audio Technica comes with a built in pre-amp and a USB connection. You can bypass the pre-amp if you want to, which earns it another cookie point in our book. All things considered, this record player is by far the best value for the money option at the moment. 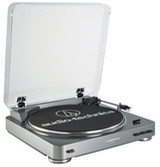 You can also enjoy our Audio-Technica AT-LP120 vs AT-LP60 review here. Compared to the Audio-Technica we just talked about, Essential III is a bit more refined turntable that also comes with a higher price tag. However, there is a perfectly good reason for this. Let’s start things off by saying that there are two versions of this model. One version comes with a pre-amp and USB support, which is a bit pricier, and the other version doesn’t sport these features. The Pro-Ject Essential III plays your standard 33 and 45 RPM records and features a fully adjustable tone arm. However, it has no height adjustment and features a very rudimentary anti-skate device. So, everything so far seems to be inferior to the Audio-Technica, yet it costs more. Why is that? Well, the Pro-Ject Essential III definitely is a bit more limited in the features and customization departments. However, it offers one benefit which compensates for all of the shortcomings we have listed—its anti-vibration technology used by Pro-Ject is superb. This translates to incredible sound quality, which is what we are all looking for at the end of the day. Yup, we got another Pro-Ject model for you, this time it’s the Carbon record player. Now, this one is pushing the limits of your budget, but it definitely belongs on this list. Generally, you get similar specs to Essential II in terms of RPMs supported and how adjustable the tone arm is. Again, just like the Essential II, it comes in two versions. One has a pre-amp and USB support, the other doesn’t. Unfortunately for us, the more expensive Carbon with the pre-amp and USB goes outside of our budget, so be prepared to spend some extra money on a dedicated pre-amp. The only reason why this record player is on our list is the tone arm. That is it. The package as a whole is not that attractive, but the tone arm simply warrants mentioning Pro-Ject Carbon at some point. What makes this particular tone arm so special is the fact that it’s made out of carbon fiber, hence the name. Using carbon instead of usual metal alloys gives you way better, unwanted resonance damping as well as the general performance of the tone arm. 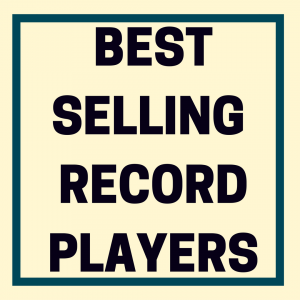 For this reason alone, Pro-Ject Carbon is among the top 3 consumer grade record players on the market. You can also read our Project Debut Carbon review. Compared to the models we listed above, this Marantz is consumer grade to the core. What you get is a more or less plug-and-play turntable that requires little to no calibration. Depending on what your attitude towards record players is, this can be a good or a bad thing. We personally don’t like the user being limited in this way, but Marantz TT42P has some qualities which make it a great choice for our purpose. In terms of records it can play, both the 33 and 45 RPM are supported. This is a belt driven unit with an exceptionally well-made motor that does a decent job at eliminating unwanted vibrations. The tonearm is pretty much calibrated out of the box, and you won’t be able to change much at all. This is why we have a grudge against this model. If your cartridge or stylus goes belly up, you will pretty much have to use the OEM part. No customization is available what so ever. With that said, the sound quality is great and you get some automatic features like auto start/stop. It’s the one and only Marantz! At the beginning of the article, we specifically said that anything under $200 is generally not worth the money. While this still stands, there are some exceptions to the rule. We’ve decided to include one super cheap model that will appeal to those on a very strict budget. Audio-Technica LP60 is the king of the affordable segment, and ruler of cheap barely acceptable performance. Alright, so what you get with this package is a very rudimentary system that is designed to give you a basic experience. This turntable plays the standard 33 and 45 RPM records, comes with a built-in pre-amp and delivers a decent sound. What it doesn’t offer is USB support, any kind of counterweight or tonearm adjustment, and no anti-skating systems. All of this translates to you being very careful with which records you play and how you setup the turntable. If you are seriously under budget, this is the only model we recommend under the $200 range. We’ve seen the vinyl aficionados recommending this puppy quite a few times, and in most cases, people were in awe by how cheap this thing is! You can also enjoy our Audio-Technica AT-LP60 review here. Needless to say, it’s inferior to other items from the list, but for this price, no complaints! At the end of the day, the models we have shown you here are just a general guideline. Everyone has their own taste, and just the appearance of a turntable can sway someone to go for that particular model instead of another one. 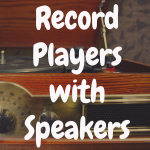 The info above should give you a clear enough picture of what the basic principles and components of a record player are, and what you should be looking for. For those of you who want a bit more detailed information about the anatomy of a turntable, we strongly suggest you visit the links we have provided in this guide. Those guys have been dealing with this stuff for decades, and have a lot of knowledge to pass on. If you need more model specific reviews, Vinyl Harmony is a great resource that is dedicated to this particular type of audio gear. With that, we leave you to make some important decisions, and hopefully soon you’ll have a working turntable setup that will give you numerous hours of high fidelity audio experience.